I am honored to be a part of Tiffany Soto’s dream team for her wedding this May! Tiffany is a distinguished and well recognized sake sommelier. Her wedding has been followed by several people in the industry and the planning process has been featured in the debut wedding issue for 944. Check out Pages 96 through 100 for the full article! 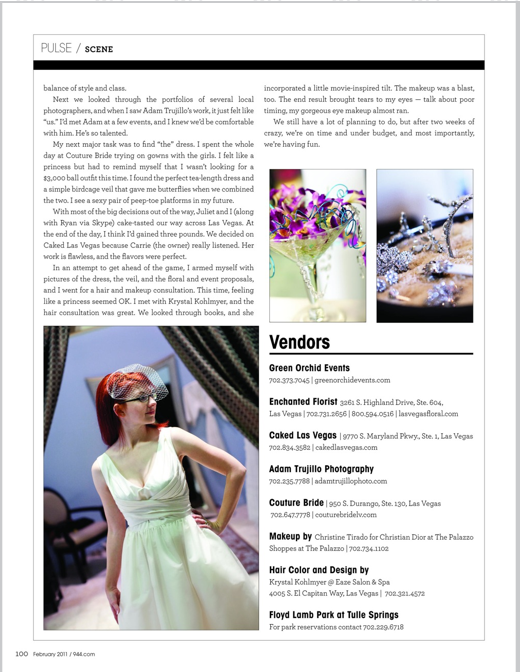 Some of the amazing vendors working on this beautiful and well planned out wedding are Juliet Douglas of Green Orchid Events, Enchanted Florist, Caked in Las Vegas, Couture Bride and many others!